I’ve been a long standing fan of the Football Manager series, stretching back to my debut with the games in their original Championship Manager incarnation. Each year, there is something of a debate about whether buying into the yearly releases is worthwhile. Most of the time, the answer is an easy “Yes”, but with Football Manager 2015, I find myself unsure of whether this edition is a must buy. This is still a game where you can create your own fairytale stories. 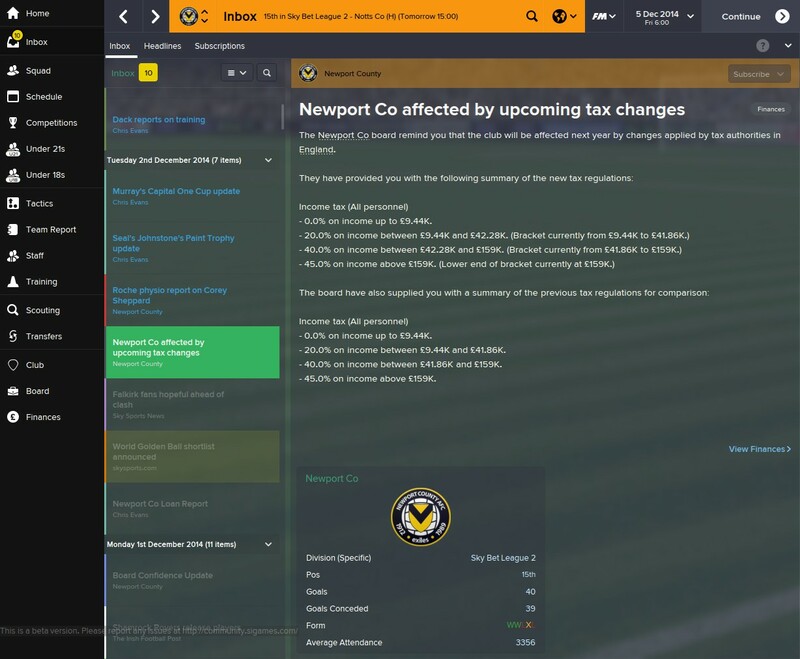 I’m working on bringing Newport County up through the English leagues having decided that I need a break from the Welsh Premier. I love the thrill of battling away in the closing stages of the season to pick up the points required to keep your chosen team in the play-off places then making a last match drive to the promotion spots. But yet, something feels a bit off with the game this season. A nice overview of the County’s expectations. Last year’s game was a brilliant creation and one of SI Games’ best efforts, but after a swathe of fairly large changes this year, things don’t feel quite as refined as they should. The guys at SI have radically overhauled the 3D match engine with a massive number of new animations, new stadiums and much improved player detail. The trouble is that all too often, the animations don’t look realistic. You see players pausing on the ball in the six-yard box for no reason, while others fall over when it doesn’t appear that a tackle has been made, and that is not to mention some questionable goalkeeping. I’ll be honest that the match engine has come along way since the pre-release beta where I was regularly experiencing score-lines in the 5-1 and 7-3 range. While the worst of the issues have been resolved, the match engine still needs some serious tweaking. It is nice to see mid-match team talks make an appearance, but I’ve not seen much evidence of their direct impact so far. Tunnel interviews are a nice addition, but could be so much more. Away from the field the big addition is the chance to set your manager up with different skills. You can choose whether you are a coach who focuses his attention on training and developing players, or someone who thrives on man management and has a strong level of player knowledge. I’ve gone a bit mad with these attributes. It is a wonderful idea, and something I have been looking forward to for a while. The RPG elements of the Football Manager games are certainly something that have had room for improvement for a while. Being able to take part in training yourself is welcome, and it can certainly provide a boost to lower league clubs who can’t afford a large collection of backroom staff. Besides this, it comes across like an idea that is still very early in development, as such it doesn’t make much difference to how you play the game once you’ve allocated your points. The increased focus on finances in all aspects is great to see. I would have expected the manager attributes to have a greater impact on your interactions with the media, sadly I haven’t noticed anything to this effect. In truth, the media briefings are much the same as ever. 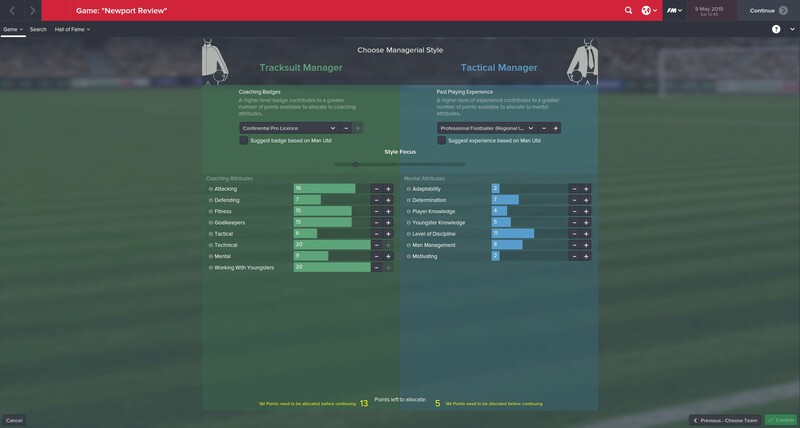 After a few in-game months, I find myself answering questions by default, choosing options to boost player morale and generally trying to avoid developing any bad blood with the chairman. What I found disappointing was that I didn’t receive any questions from the media after I guaranteed Newport County a place in the playoffs. I wasn’t expecting a long sequence of questions until the playoffs themselves, but surely something congratulating myself and the team on securing a place would have been expected? I will say that it is nice to see the inclusion of tunnel interviews. A chance to talk about specific issues just before the match is a positive step forward, and thankfully these interviews are limited to the big matches. 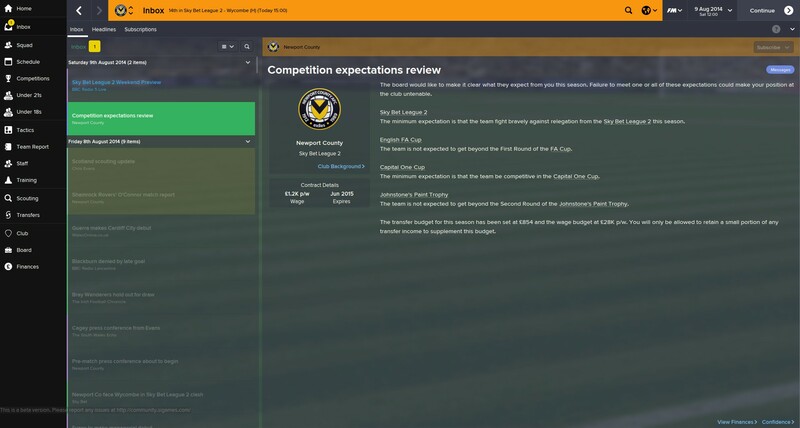 While I have been quite negative, it isn’t because Football Manager 2015 is a bad game, it is just that in a series that has set such high standards, there are times when it can ever so slightly lose the edge which makes it stand out. I think this is one of those times, but it isn’t all bad news. On the face of things, the new user interface is a joy to behold, moving the menu bar back to the left of the screen is a wise choice and it certainly lets you access the key features easier. There are some options which just aren’t as obvious as you would like though. The menu for filtering your player search results eludes me whenever I head to the screen resulting in some annoying clicking around to find it. For the most part though, the new interface clearly lets you know what you need to see. However, I’m not keen on the only available skin being so dark. A mix of last year’s white skin with the new layout would have been nice. 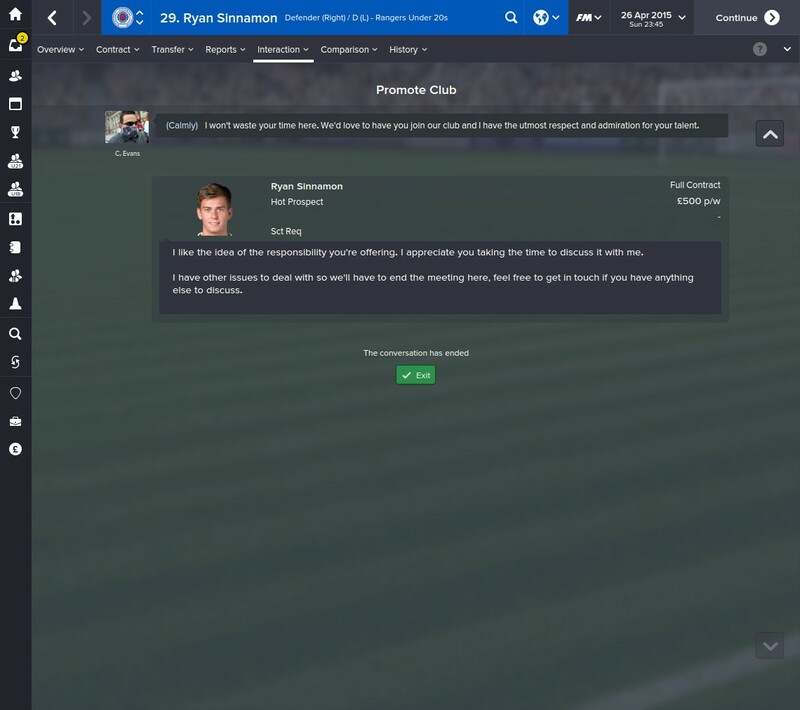 Trying to convince players to even enter contract negotiations is a cool feature. The massive revisions to the scouting system are definitely a highlight in the game. No longer do you know everything about a player after one scouting trip, this time around you need to send your scouts out a few times to get a complete picture of the attributes of the player you are scouting. Tied with this, the scout reports are more detailed and have a lovely, easy to understand, graphical representation of the strengths and weaknesses of the player. The system feels much more realistic, and it has been combined smoothly with the old player search system. It makes the process of finding new players a much more rewarding system. Negotiating a contract with your targets has also seen some changes, which are definitely for the better. If your target isn’t likely to be that receptive to your approach, you can have a chat with them before getting to the nitty gritty of the contract itself. Here you can promise the player to become club captain and expand on the potential to further their career with your team. It is only a small feature, but one that I find adds a lot to contract negotiations. Further focus on different aspects of football – youth development here. Though I might have missed this last year after playing as TNS too much. What we have here is a game that seems to be at the start of a new life cycle. The new interface is good, but could be improved in some areas while the match engine has undergone a hefty visual update at the expense of the action. The manager RPG elements are trickling in, but they don’t add much to the game at the moment. I wouldn’t be surprised if next year there are more overall improvements to the media interaction which will hand in hand with an improved manager development system. 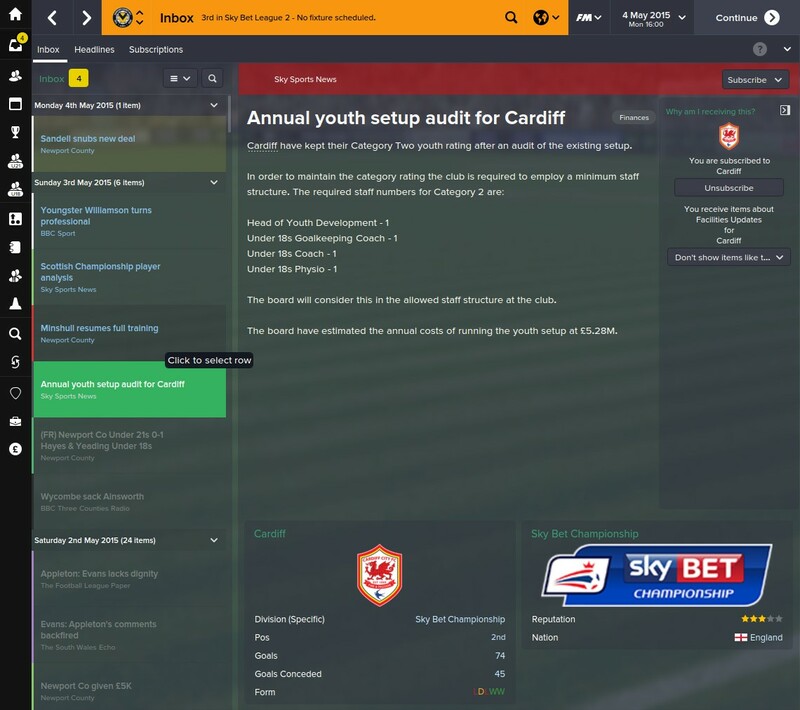 I will say that the ever increasing realism and focus on the true finances in the sport has been well captured in this game, that is something I expect I will be paying attention to when I start a career with TNS. 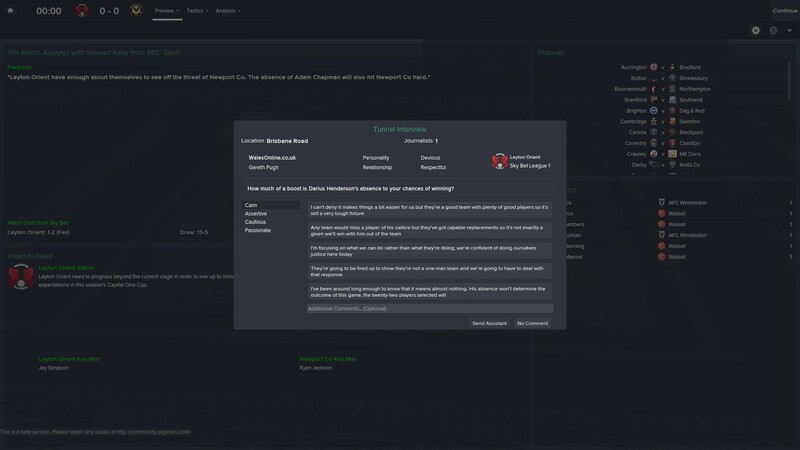 At the end of the day, Football Manager is about the stories it can bring you, and this edition will let you experience those highs and lows as ever before. You just need to ask yourself if the other stuff adds enough to convince you to buy it. Better yet, check out the demo on Steam and take a crack at six months of football management. For more on our scoring policy, please read this post. Review copy based on Steam code supplied by Sega PR. Final note – the different screenshot sizes are where I’ve switched between full-screen gaming to playing the game windowed.